Coverage: Live on BBC Sport app, on Connected TV and on the BBC Sport website. Catch up via BBC iPlayer. 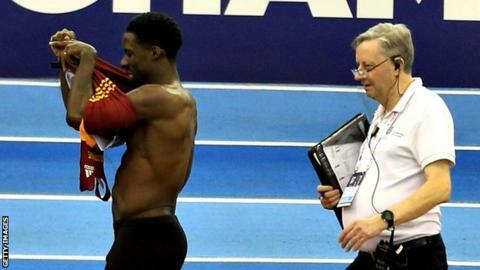 Dwain Chambers was disqualified for a false start in the British Indoors 60m semi-final in Birmingham, ending his European Indoor Championship hopes. The former world indoor champion, 40, needed a top-two finish and to reach a qualification standard of 6.60 seconds. Asha Philip finished strongly in the women’s 60m to win in 7.19 seconds. In the women’s 60m hurdles, heptathlon specialist Katarina Johnson-Thompson finished second in 8.27 seconds as Cindy Ofili claimed victory in 8.16. The men’s 60m was won by 19-year-old Dominic Ashwell in 6.64, narrowly missing the qualifying standard of 6.60. He will have another opportunity at next week’s Muller Indoor Grand Prix in Birmingham. Rachel Miller of Thames Valley ran a personal best of 7.20 to finish narrowly behind Philip in the women’s 60m and secure a place in her first senior championships. Holly Bradshaw claimed pole vault victory in her first appearance at the event for five years, recording 4.80m – just the fourth time she has achieved that height. Chambers retired in July 2017 and has only competed twice since. After easing through his opening round on Saturday, he was too fast off the mark in his semi-final. “I feel like a fossil coming back into the sport again and being resurrected,” he said after his disqualification. The 60m final will take place at 17:00 GMT with the 2014 world indoor champion Richard Kilty among the qualifiers. Chambers was banned for doping in 2004 but returned to the sport in 2006 and won the 60m world title four years later. He attempted to break into American football during his two-year doping ban and did so again in 2007, before an unsuccessful trial spell at rugby league club Castleford Tigers in 2008. He took gold at the World Indoors in Doha in 2010 and bronze two years later in Istanbul but last represented Great Britain in 2014. The European Indoors take place from 1-3 March in Glasgow.